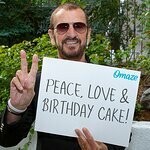 Ringo Starr made a wish come true for a young brain cancer survivor last week when he gave him a set of drums. Ringo met young brain cancer patient Alexx Kipp as part of a Make-A-Wish Foundation wish last Thursday to launch a new partnership between the charity and Hard Rock International. Playing drums had played a major part in helping Alexx get through his treatment, and his wish to meet Ringo was punctuated by a surprise gift from the Beatle drummer – a brand new drum set. 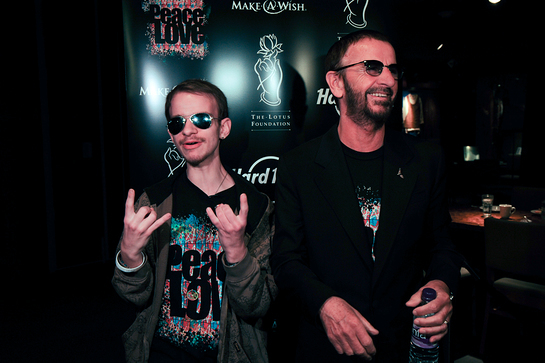 As part of the new partnership between Make-A-Wish and Hard Rock International, Hard Rock locations will sell new T-shirts and pins designed by Ringo, with 15% of proceeds being passed on to Make-A-Wish through Ringo’s Lotus Foundation. View the shirts here.